While it may not be one of the more memorable animated features in recent memory, Mr. Peabody & Sherman gives audiences a respectful amount of inventiveness and good humour. Making a splash during classic Rocky and Bullwinkle cartoons, time travellers Mr. Peabody and Sherman would rapidly entertain within a short period of time. I always remembered these segments for their agility and their knack to glide across history using blink-or-you’ll-miss-’em tactics. The animated adaptation doesn’t stray too far away from these original animated shorts. The animation respects the original creation and somehow finds a balance between crisp creativity and traditional graphics. The film doesn’t present itself as a dated product, and it doesn’t have to resort to pop culture fads to make itself modernized. Although, Mr. Peabody’s brief zumba’ing provides a good chuckle early on. In a stroke of casting genius, Ty Burrell (best known for his work on TV’s Modern Family) voices Mr. Peabody. His fatherly demeanour along with his mixture of concern and cheesiness fits within this furry wiz. Max Charles, who voices Peabody’s adopted son Sherman, is just as amiable as a curious sidekick. Mr. Peabody and Sherman reunites director Rob Minkoff with animation – it’s about time! His efforts behind the Stuart Little films and The Lion King have had resonance with families. It’s nice to have this filmmaker take the reigns of a film and a genre he’s impassioned for. He directs this film with zeal, and manages to find a usual consistency with the film’s entertainment factor. The film starts to slouch when Craig Wright’s screenplay gets too wrapped up in historical backdrops and facts. That must sound silly because of how this film’s main focus is history. But, it’s only troublesome when the jokes get too comfortable with references rather than originality. These dryer occurrences reminded me of when The Pirates! Band of Misfits took matters to land to compete in a science competition recommended by Charles Darwin. The writing is too impressed with itself that it’s worked in these famous faces from history’s most prolific events, and forgets to make any jokes its prime demographic will understand. Most of these jokes are going to fly over kids heads unless they’re in the fourth grade or higher. 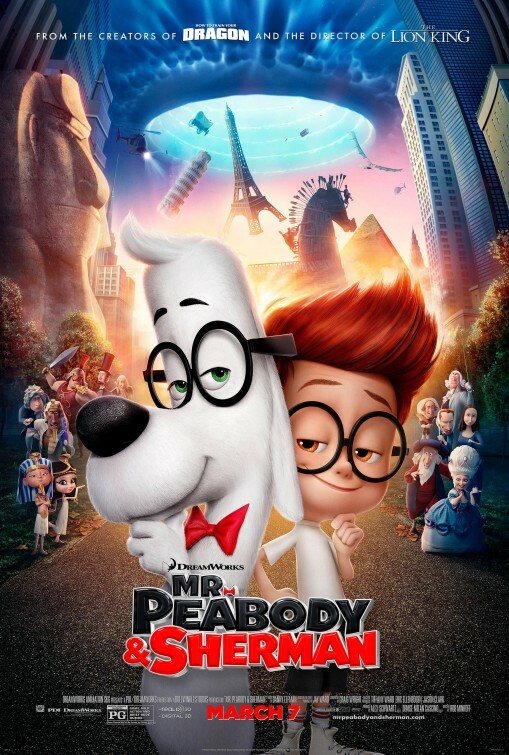 So, chances are if you’re a parent and you’ve brought your children to see Mr. Peabody & Sherman because they wanted to see “the cute dog with the bowtie”, you may find yourself settling down fidgety kids. That, or you’ll be surprised that the film is straight-up copying Bill and Ted’s Excellent Adventure during its climax. However, Wright is able to speed his script up at the right times with Minkoff’s help whenever Mr. Peabody is explaining time traveling and the perils that follow. Even the most nitpickiest of theory spoilers will find themselves throwing in the towel during the busy yet interesting final act. Mr. Peabody & Sherman is a relatively enjoyable, cute flick. It pulls some unique punches, but you’ll have a hard time remembering what impressed you when you’re heading back home. Depending on its success, I can see a sequel possibly coming to fruition. However, I do believe Mr. Peabody & Sherman is a film that has enough juice in its system to supply this one movie. I don’t think a sequel would hold up well and it’d run its course rather quickly. That said, I’ll happily eat my words if Minkoff can prove me wrong and send me into a more joyful daze in the future.